Ostensibly in pursuit of material to support my research on the foodways* of the Pacific Northwest, I collect old restaurant menus. One of my most treasured acquisitions is a tattered carte from the State Cafe of Huntington, Oregon. Huntington is located at the confluence of the Snake and Powder Rivers. It began its career as a city by being the joining point in 1884 of the Oregon Short Line Railroad and the Oregon Railway and Navigation Company, creating what became the transcontinental route of the Union Pacific. Until the 1960s, Huntington was a railroad shop town, where workers were working 24/7. They were eating 24/7, too. 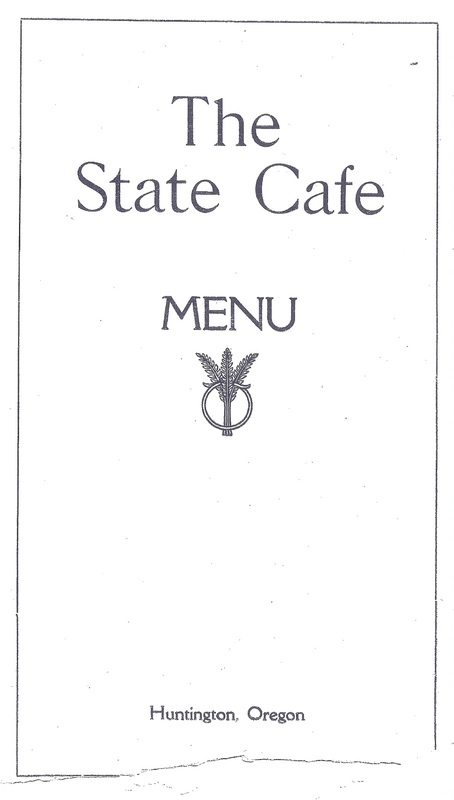 At the State Cafe, they had a tremendously varied menu. Doubtless not everything listed was always instantly at hand, and canned and packaged goods no doubt were staples. Still, the array is remarkable for a cafe in a town with a population of no more than 1,500 people (there are about 560 residents today). A dozen or more salads, eleven potato preparations, seventeen omelette varieties, 27 beef dishes, and, “in season” (that is, fresh), twenty-two different ways of preparing oysters. These were virile, manly meals. So when was the State Cafe dishing up these choice viands? The menu provides some good clues, and more of them than most menus will do. The first clue is the listing for a “liberty pancake.” During World War I, our recoil from things German turned sauerkraut into “liberty cabbage” in popular parlance; similarly, here the German pancake, an eggy breakfast treat often called a Dutch baby, was renamed a liberty pancake. The second clue is found under “sandwiches”: the Theda Bara. It’s unusual for a small-town cafe to put a fancy name on a sandwich, and this is the only example in this menu. Theda was a silent screen actress, a vamp with soulful eyes, and she must have been popular in Huntington. But Theda’s popularity was short-lived: she burst forth in 1914 with The Stain, and aside from three brief film appearances in 1925 and 1926, her career ended in 1919. 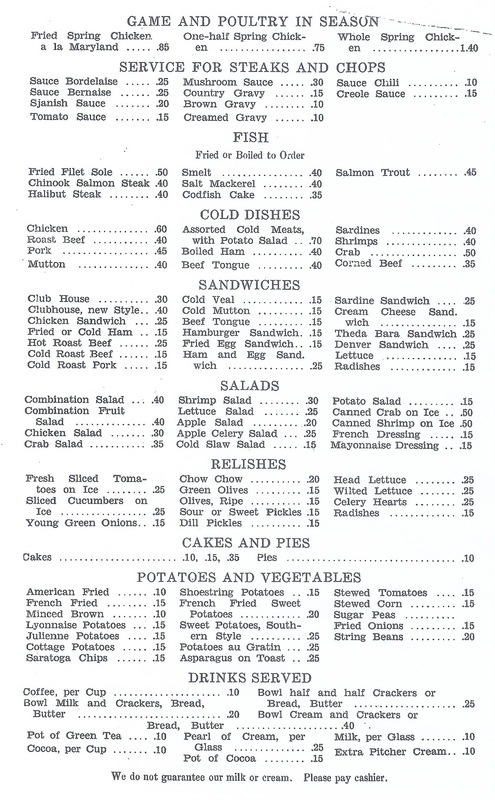 So we can be very comfortable with saying that the menu is from about 1918, when the Germans were anathema and Theda was starring in Salome and The Siren’s Song. There is still the matter of all those oysters. Why are there both “Puget Sound oysters” and “Eastern oysters”? What’s with those “Olympia oysters”? How did oysters get to Huntington alive? We’ll take up with the oysters later. 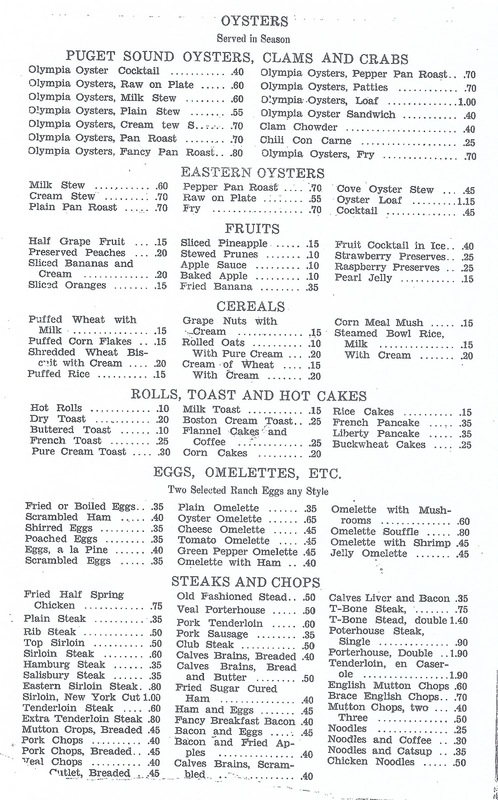 Right now, think about sitting down at the State Cafe counter for a brace of English mutton chops, shoestring potatoes, some stewed tomatoes, and maybe a side of apple celery salad, and with big cup of coffee.